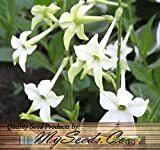 Tobacco plant for sale – Easy plant to grow, grown for the ornamental flowers and for the leaves and also for smoking, planting in spring, better to buy plant or another option to start from seeds. Tobacco plant for sale – What need to know before growing Tobacco plant? When is the best season to buy Tobacco plant? Need to know before buying Tobacco plant that can start from seeds or cutting, fast growing plant that need full sun, well-drained soil, optimal temperatures of 20–30 °C (68–86 °F), can harvest after the plant establish can harvest the leaves when full grown, after harvest need to dry the leaves and hang it to dry. Tobacco plant season it’s in the spring better start in the end of the winter in greenhouse.